The EFF is not painting itself with the same brush it often uses to coat others in a glossy veneer of corruption and suspicion. Following the packed press conference hosted by the party's leadership on Tuesday, it is now clearer than ever that they regard themselves to be above suspicion. But there were some glaring inconsistencies that emerged during the three hour-long media session hosted at their Braamfontein headquarters. While the EFF leaders took time to bring some details to light on the steps they've taken since the publication of a report into the R1.8bn fraud at the VBS Mutual Bank, EFF commander-in-chief Julius Malema insists his deputy president, Floyd Shivambu, has done nothing wrong. Shivambu may have benefitted from R16m in "advisory transactions" or "consultancy" work his little brother, Brian Shivambu, did for Vele Investments, the largest shareholder in VBS. But Malema has now defended Shivambu. Initially, Malema said he had satisfied himself that Shivambu was innocent. Only later in the press conference, when pushed, did he state that if Shivambu had not made a full declaration he would have committed serious misconduct. This is a startling concession. 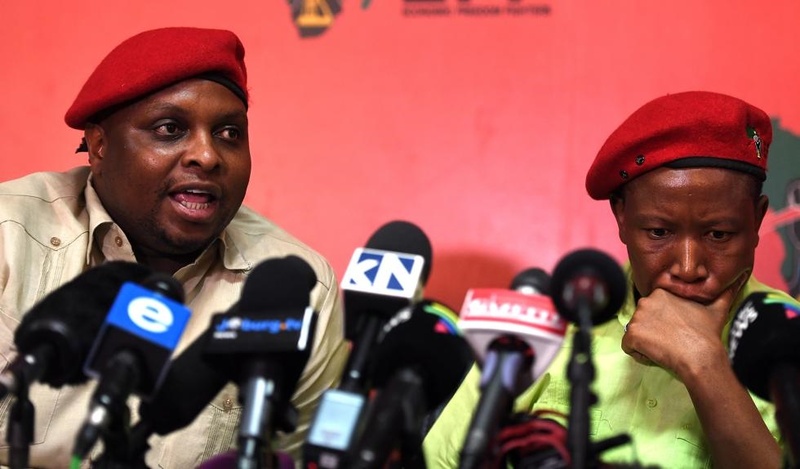 Malema has essentially pronounced to the voting public that the VBS allegations surrounding the Shivambu brothers are baseless – before he has been presented with all the facts. This is a tactic we see far too often from the ruling party – deny and deny again until it all just goes away. Reports by the Daily Maverick that Floyd Shivambu received R10m from his brother were slammed as "insanity" and "madness". But the true insanity and madness lie in the party taking a stance that it believes Shivambu's version at face value, when all roads lead to a dubious conclusion involving R16m of looted money. Malema was at pains to draw attention to the fact that some media houses have unfairly focused their coverage of the VBS bank scandal on the EFF. He asked for fairness, and ridiculed the media with baseless allegations that it was part of a plot to destabilise the party. If you read the VBS report by Advocate Terry Motau, you will notice that he does not allow the report to stray into the political realm. Instead, he actively steers clear of mentioning any person's affiliation to a political party. Malema is right when he says the biggest scandal lies with ANC politicians who were bought and paid for with money stolen from the vulnerable and poor in Limpopo. The ANC too has been fielding difficult questions over its involvement. But it seems the ANC is (perhaps due to years of experience in this area) far more adept at managing the fallout of Motau's report. The entire EFF leadership was unreachable for hours after the report was published. Brian Shivambu disappeared off social media (only to miraculously reappear a day or two later) and media statements issued by the EFF immediately in the wake of media reports linking Brian to Floyd and VBS, ignored the Shivambu links. Malema and his fellow leaders must understand that they cannot continue to deflect attention like they tried so very hard to do on Tuesday. The reason the Shivambu issue drew so much attention to begin with, from myself included, is simple – the EFF has been publicly vocal and aggressive over the VBS issue. In short, the EFF drew our attention to VBS far sooner than many media houses would have invested resources to cover. The party made its bed and must now sleep in it. In response to a question from News24 on Tuesday, Malema said that he is not an investigator, nor an investigative journalist. He told me, in response to a question over why the EFF never looked into VBS's affairs, that this is my job – while at the same time criticising the media as a collective because it dared bring the EFF into the debate. He, together with Shivambu and EFF national chairperson Dali Mpofu, repeatedly made the point that the 22 000 or so depositors, the clients of VBS, were the victims. But why then did the EFF not seek to actively expose wrongdoing at the bank, as it has done repeatedly with Jacob Zuma, Nhlanhla Nene and recently the Independent Power Producers (IPP)? Malema said again on Tuesday that he has information on the IPPs that he is in the process of verifying. Well, CIC, I have done my job with the information I have available to me. And your deputy president needs to be put under far more serious scrutiny. Looking at some bank statements presented to you by a man who may have a lot to hide is not exactly a forensic approach. You have now told the voting public that you did half a job and came to a conclusion before you had the full picture. This is exactly what you accuse the media of doing. As a member of the ANC Youth League, you were well aware of corruption in the ranks of the ruling party, and witnessed how greed could tear apart a once illustrious liberation movement. In turn, you have been the most vocal opponent of the ANC since the formation of the EFF. Corruption, lies, dodgy transactions and backroom political plots have been the bread and butter of the EFF, politically speaking. Just think of the "pay back the money" chants that rang through the National Assembly whenever former president Zuma took to the podium, or more recently the "Nene must pack his bags" stance adopted by the EFF. Through a lack of decisive action to properly investigate the Shivambu/VBS nexus, Malema risks bringing the same fate upon his party, which is recognised as a massive political force in our young democracy. They say you must teach your children right from wrong from a young age. Malema cannot afford to let a scandal like VBS engulf his party, his brainchild, just five years after it was born. It is clear that Malema, who has demanded accountability from the ruling party, must take urgent steps to properly investigate if Shivambu benefitted from the VBS scandal and in so doing, practice what he preaches.